Super Refocus für deinen Mac – Nachträglich Fokus bearbeiten und wirklich schnell sehr coole Effekte erzielen. 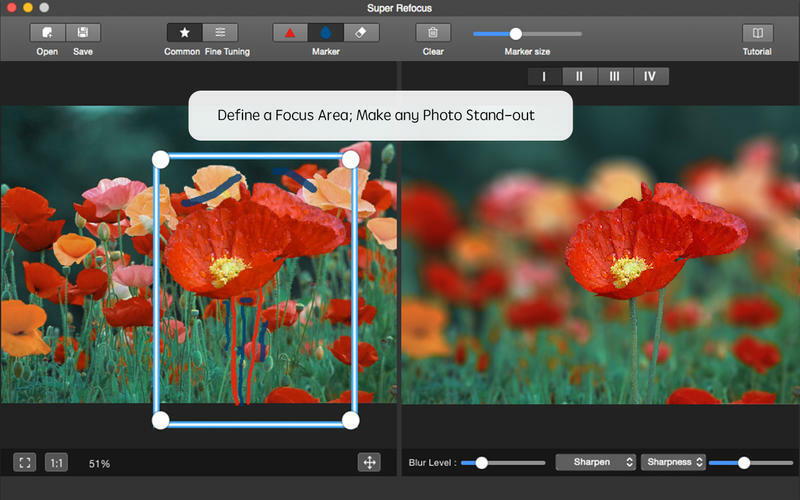 Super Refocus professionally adds focus and depth to your photos without expensive camera lenses. It easily defines a focus area and achieves lens blur, motion blur effects. Super Refocus extends filter and lens functionality beyond your camera and allows you to adjustable controls to add custom focus options to make any photo stand-out. Post-processing software is not required nor are advanced image processing skills. You don’t have to be a professional photographer to become addicted to camera lenses. Super Refocus is among the best in its class. By simply applying a blurred background and increasing the depth of field, a sense of depth is created to draw attention to the most important objects of an image. You are welcome to click on the „Support link“ to take a look at Super Refocus video reviews. Automatically determine the target prospects based on the target box with state-of-the-art image segmentation algorithm. Adjust the scope of the focus area and the background with drawing stroke. Four Perspective Modes offer different types of natural blurring effect for the background. Determine the blur gradient for any area with customized mode. Complete professional image editing with the advanced focus algorithm. Intuitively control 5 blur levels and precise adjust blur strength. Clear the target prospects with an advanced sharpen algorithm to achieve professional refocusing effect. Live previews and real-time editing. Undo, redo history can be saved so you can always undo, redo your changes with unlimited times. Accomplish things in your photos more quickly and with less effort. Download it now. ** 9.März 2016 | * Alle Preise in EURO inkl. Mwst. | Aktion gültig solange der Vorrat reicht, bzw. bis auf Widerruf.​ | Tippfehler, Irrtümer und Änderungen vorbehalten.